Homes Martyn Lawrence Bullard: What’s Hot? Martyn Lawrence Bullard: What’s Hot? Martyn Lawrence Bullard identifies his top five interior design trends of the year. Graphic tiles are making a big comeback. With the blurred lines between indoor and outdoor living, it’s fun to allow floor materials to flow through both areas. Bold graphics, especially in monotone colours and fun patterns, can spice up both spaces and make a decorative statement. For walls and especially kitchen splashbacks, these tiles make a strong trend statemen, and I believe they’ll just get bolder in the next few years. Check out my Eastern Promise collection for Ann Sacks, or the Andy Fleishman collection of terrazzo tiles for the same brand. Furniture pieces are using brass, chrome and black-metal combinations. Chair legs, picture frames, bathroom taps, kitchen appliances and dining room finishes are all getting the golden metal-mix glow. Unlike the original mixed-metal trends of the ’80s, materials are now lacquered in a natural state so they quickly tarnish, making the patina part of the look. Tom Dixon (lighting and accessories) and Jonathan Adler (furniture and lighting) have both jumped on this trend; my Urban Armor tiles for Ann Sacks are another example. Emerald green is the colour of the moment and dressing the best rooms around the world. Lacquered walls, silk velvet sofas and tufted leather chairs are all getting the emerald treatment. Greens have not been in such favour for quite a few years. Try the Benjamin Moore paint colour Deep Green 2039-10. The vintage revival is mostly inspired by the 1980s. Designers such as Karl Springer and Charles Hollis Jones inspired the overscaled soft furnishings and the use of brass, Lucite and exotic stones. Look at the furniture collections by Fendi and Missoni. Tropical fabrics and wallpapers are making a big comeback. Havana-style leaf prints and exotic flora appear on everything from window coverings and upholstery fabrics to couture gowns. 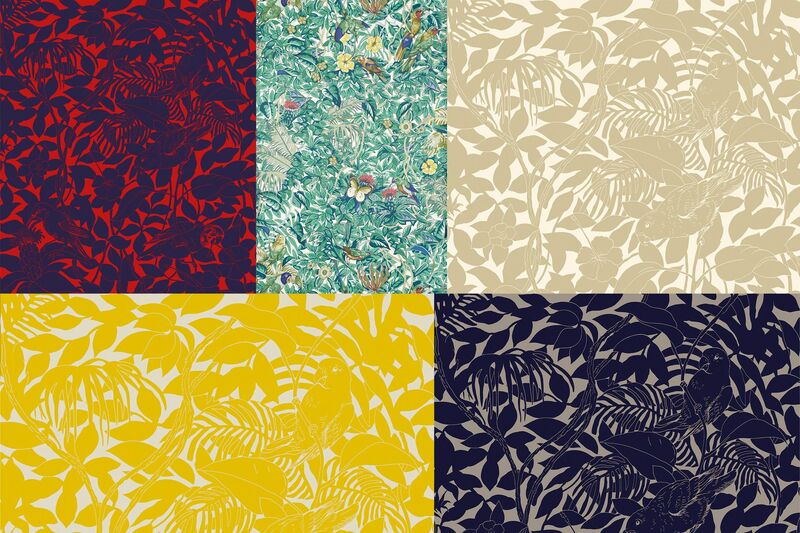 My Tropicana fabric has been inspired by this; Hermès also has one called Équateur Imprimé. Published on the September Anniversary issue of Philippine Tatler, available in all major book stores and newsstands. Download it on your digital device via Magzter, Zinio, and PressReader.